Lot surface area: 7,620 sq.m. The classrooms on the second floor are arranged along a glassed-in gallery overlooking the shopping centre, creating visual relationships among the various functions of the building; the classrooms on the upper floor have large windows overlooking the rooftops of the side naves. The school also includes a gym and music classrooms in another building behind the hotel, also designed by Diener. This building has a less monumental appearance: a glassed-in cube where the stripes marking the floors, plastered white, create a strong sense of horizontality and add motion to the facades. 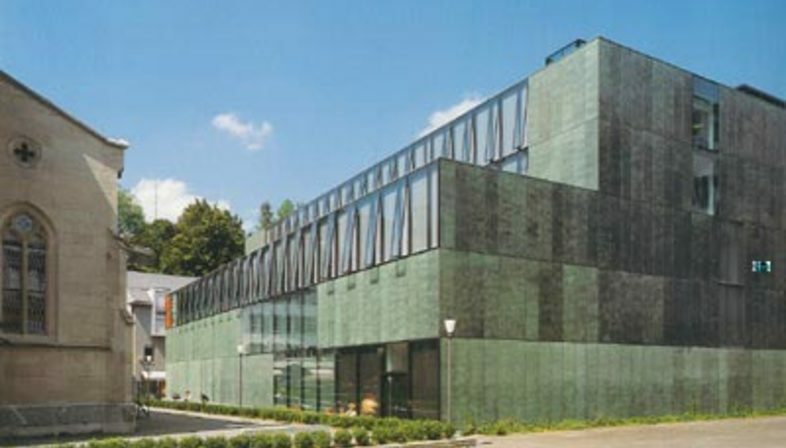 The result is particularly natural, modern architecture, thanks to the rigour of Diener's design, which uses simple volumes and makes materials and assembly elements the essential theme of the facade, like the copper plates with their clear, precise outlines, clearly distinguishable and recognisable, lending character and personality to the whole building.